The Ussing system for cell biology research was designed for studying the transport of ions, nutrients and drugs across a whole barrier tissue, like epithelial tissues. 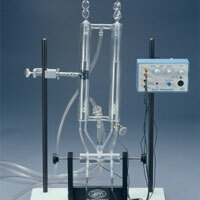 The Ussing system consists of the Ussing chamber to hold the tissue and a perfusion system. WPI's Ussing systems were developed for electrophysiology applications. A complete Ussing system would also include a WPI amplifier and data acquisition equipment. Our Ussing systems offer a quick, effective means of making low-resistance electrical connections to the Ussing chamber without the need of long agar bridges. Ag/AgCl half-cells screw into short tubes which plug firmly into place in the chamber's luer ports.